The Barbecue sauce need not add excess calories in your diet to make your food delicious. If you are cutting down calories, losing weight or want to avoid consuming extra sugar in your diet, you must buy a sugar-free BBQ sauce. High fructose corn syrup and starches make the sauces unhealthy and don’t necessarily enhance the flavor. Whether you want to buy a hot and sweet sauce, a chilly sauce or one with a tangy twist, buying a sugar-free BBQ sauce is the best choice. You will find top ten carefully selected sugar-free BBQ sauces listed below. This sauce is vinegar-based with no carbohydrates and sugar. It does not contain MSG(MonoSodium Glutamate), and it is suitable for people with diabetes. This sauce has the best blend of spices and vinegar. You can use it as a dip or a marinade for your food. This sauce is very spicy, and it is not thick at all, so it is perfect for marination. This sauce is an excellent option as a finishing sauce. 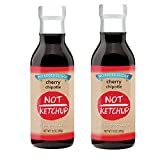 It is not a cooking sauce or anything like ketchup. This sauce contains no sugar, no trans fat and no preservatives. It contains very low amount of sodium, and it is entirely gluten-free. Though the sauce is sugar-free, you will not know it if they don’t mention. It adds flavor to all kinds of foods be it poultry, meat, vegetables, beans, fish or something else. It is a fantastic blend of spices and natural ingredients that let it maintain its unique flavor. Low Nutritional Value, Good For Flavoring Only. It contains sucralose instead of sugar for sweetness. Sucralose is made from sugar, but it contains no calories. It is a lot sweeter than sugar and does not affect the insulin levels of most people like sugar. This sauce is gluten-free, and it has a great flavor. It can be used as a cooking sauce, with sides, vegetables and in almost any way you like. Sucralose in the sauce can have some effect on the insulin levels of people who are not used to consuming it. You can use this barbecue sauce as a salad dressing with a little bit of cinnamon or black pepper. It contains no fats, no carbohydrates, no calories and no gluten. It is made with apple cider, dijon mustard, vinegar, minced tomatoes, cayenne pepper, herbs, and spices. You can use this sauce in a large variety of ways, and it tastes a bit similar to the ketchup, but without all those calories. Some people may not like the ketchup flavor in a barbecue sauce. 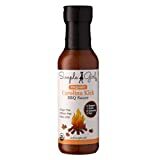 This BBQ sauce is an amazing blend of natural superfoods. It is gluten-free and does not contain any sugar or salt. It does not contain any chemicals or preservatives. It is excellent on the grill, but you can use it in a variety of different ways. You can use it with snacks, popcorns, salads, sides, meat, vegetables, eggs, for marination or as a cooking sauce as well. It contains bell pepper, garlic, paprika, turmeric, onion, cumin, cinnamon, thyme, fennel, and nutmeg. It tastes quite different from regular BBQ sauces. It is thick and creamy sauce which is neither too hot nor too mild. It does not add any extra calories to your food, and it is gluten-free as well. Whether you want to enjoy buffalo wings, chicken or shrimp, it is good for all. It has a great flavor with little salt and mild hotness. You can also marinate chicken with it or use it as a cooking sauce too. Some people may not like the tomato flavor in the sauce. It is excellent for marinating all kinds of meat. It adds a nice flavor to the meat without making it too salty. It is a perfect barbecue marinade on the grill for delicious chicken. It contains no MSG, and it is gluten-free. This sauce is great for low-carb diets as it is sweetened only with fruits. It can be used as a dip, for grilling, glazing or simmering. It is gluten-free so people allergic to gluten can enjoy it too. No preservatives, artificial colors or flavors are added to the sauce. It has a great consistency with a little fruity taste to it. It has a unique sweet-smoky character that you can enjoy with meat, fish, eggs and all kinds of foods. Colgin liquid smoke is gluten-free, vegan-friendly with no additives and preservatives. You can add smoky flavor to any food with it. It is perfect for marinating chicken on the grill or using as a cooking sauce. You can also use it as a dip for sides, burgers, eggs, salads, beans, snacks, etc. It can also add a smoky flavor to your soups or gravies when used as a seasoning. This vinegar-based sauce contains no artificial sweeteners. It is sweetened with a natural sweetener, stevia. It contains no fat and almost no calories. It is gluten-free and contains no added chemicals, transfats or MSG. It can be used as a marinade, dip, salad dressing or a cooking sauce without worrying about calories. It has a zero glycemic index, so it is suitable for people with diabetes as well. It is entirely free from animal products, so it is vegan-friendly too. It has a fantastic flavor which is compatible with almost any food. You can easily avoid consuming excess sugar if you make a right choice while purchasing the BBQ sauces. Traditionally, BBQ sauces have always been high in sugars and other unhealthy ingredients. With the options listed above, you can savor the flavors of your favorite food without counting calories in the background.